Pre-Pointe is offered for ages 10 and 11 to prepare students for class in Pointe shoes. 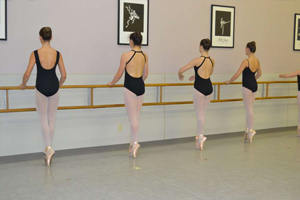 Pointe is offered for students 11 and older who meet the criteria required based on the instructor’s evaluation. Any style solid Black leotard (no embellishments or attached skirts on leotards). Footed Body Wrappers theatrical pink tights, (no undergarments are to be worn under tights). All tights must cover the whole foot – no tights rolled up to calf. NO “Bootie” shorts over leotard. Black wrap skirts are allowed. No Gaynor Minden pointe shoes accepted. (This is a professional shoe only, NOT recommended for students.) Please See Mrs. Amy for any future pointe shoe purchase. Mrs. Amy is available to help with fitting the proper shoe for your child. Please contact studio for more information. Note: NO pointe shoes for Pre-pointe class. Ms. Amy will take the class, as a group, to fit the students’ first pointe shoes. The time for students to get pointe shoes will be determined by Ms. Amy, and is based on strength and progress in the class.